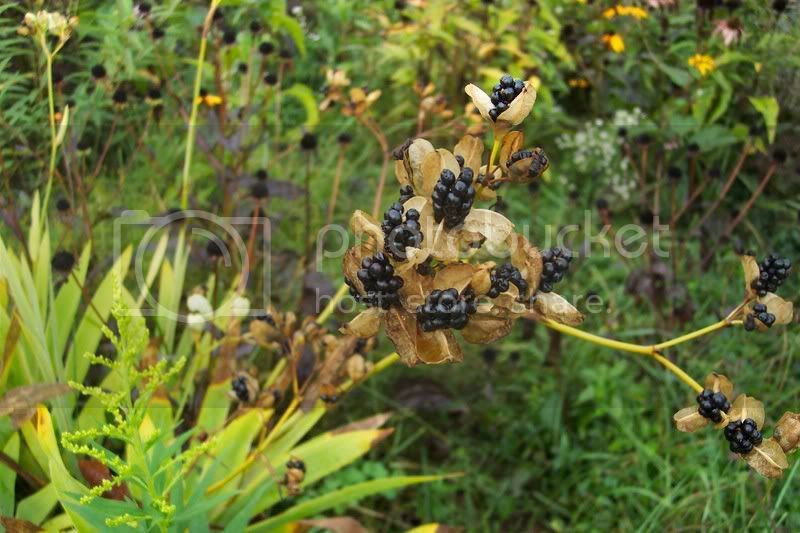 Remember back in August I promised that I would show you what a Leopard Lily (Belamcanda) seed cluster looks like? Now you know why its other common name is “Blackberry Lily”. Even though the common name is Blackberry Lily (sounds delicious), it really belongs to the Iris family. Since Irises are considered poisonous, we must assume these are poisonous as well…so… don’t eat them! 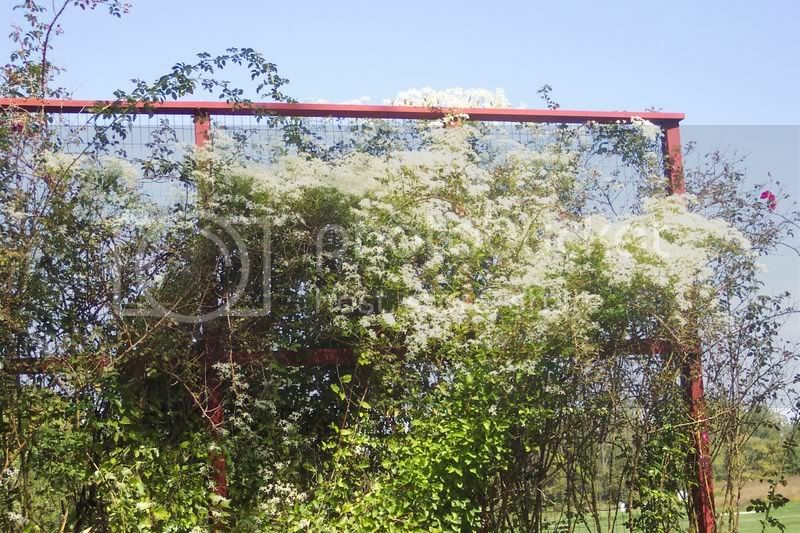 I’ve noticed in a lot of gardener’s yards, a cloud of white flowers on fences, trellises, and even sheds. Maybe you are seeing it too. What we are looking at is the very popular fall blooming clematis ‘Sweet Autumn’. This is a very vigorous yet non-invasive climbing vine that puts on quite a show this time of year. It is readily available at most garden centers and nurseries and is relatively easy to grow. It’s not unusual for this vine to grow up to 20′ the first year. We have ours planted amongst the climbing roses. This gives us some visual interest on the trellis during a time of the year when the roses look pretty tired. Since they are fall blooming clematis, they are best pruned in the late spring by cutting the vines down to about a foot tall. This sounds drastic, but stand back because the vines will come roaring back and have your trellis covered with new growth by mid-season. As an added bonus, the flowers have a sweet, but not over-powering fragrance. What more can you ask for in a plant? 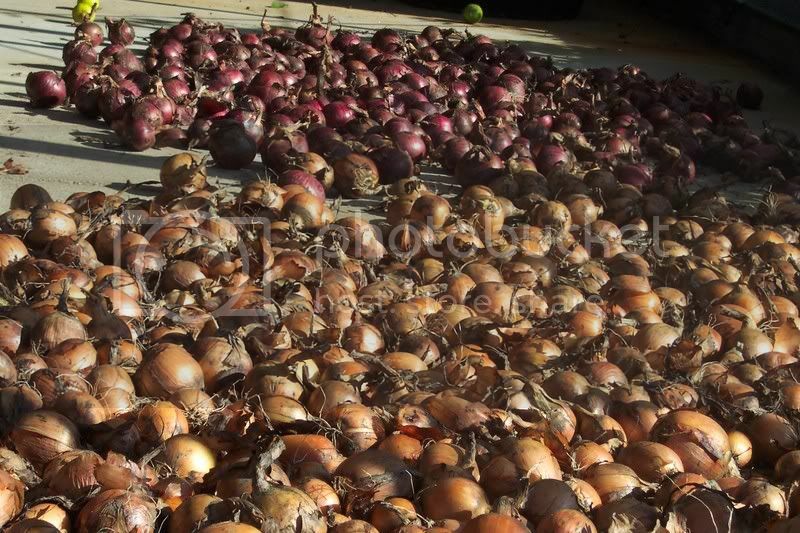 The onions have been dug and taken care of a few weeks ago. I thought you might like to see part of our crop since you saw them get planted in the spring. They were ready to harvest when the tops began to fade and fall over. We knocked over the ones that were still upright and waited a few days before digging. After digging and washing, we closed the sun shade and dried them on the floor of the empty greenhouse. We were looking for a shady, airy place for the onions to cure. The red onions are “Mars”, a good ‘burger or salad onion. They are mild and have great color, white with red rings. They are not for long term storage. The onions in the foreground are “Copra”, a very good onion for long term storage. As a matter of fact I still have some in the cooler from last year and they are still good! Copra onions are strong flavored when eaten raw. They are a marvelous cooking onion, however, making wonderful grilled onions or French Onion soup. Speaking of which, I haven’t had dinner yet! The raspberries have been ripe for a while and are still going strong. As a matter of fact these later raspberries are bigger and tastier than the first picking. The variety we have is a fall bearing type called ‘Heritage’. 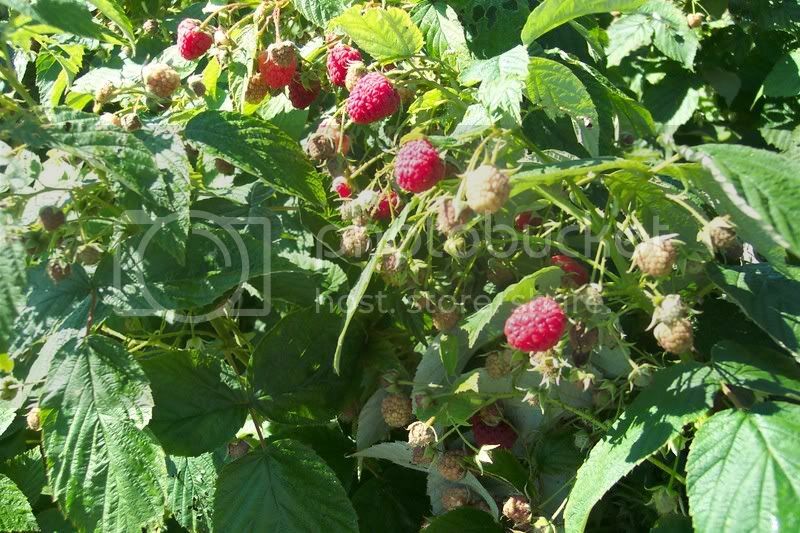 This is the most popular variety of raspberry grown in the world… and for good reason: 1) you can sometimes get a small crop of berries the very first year you plant them, 2) the berries are nice and firm which means you can pick them without destroying them, 3) they are resistant to most raspberry diseases. Heritage was developed by Cornell University over 35 years and was named 2004 Variety of the Year by the American Society of Horticultural Sciences… talk about a long time to get some recognition! I guess that proves there is still some hope for the rest of us (I’ve been waiting for over 35 years too). The major objection I have to growing raspberries is the fact that they take me so long to pick. I would never make it as a full-time professional raspberry picker. 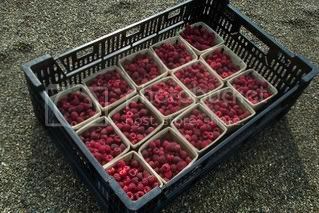 It is worth the effort though, there is nothing like fresh picked raspberries. These 15 pints of berries took me, well, I don’t know how long to pick, but it was a while. Next year I’m going to use 1/2 pint baskets… that way I can give away twice as many containers of raspberries in the same amount of time! We have been digging carrots for a few weeks now. This variety is called ‘Nelson’ and is considered an early variety. We started harvesting our Nelsons when they were big enough to make it worth all the effort of digging and washing. Now, they just keep getting bigger and better tasting as the weeks go by. 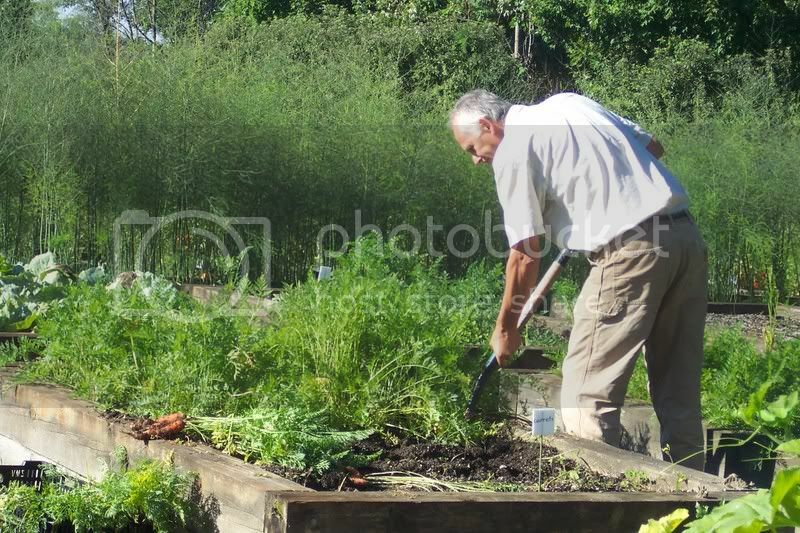 To help the carrots come out of the ground more easily, I use a garden fork to loosen the soil next to the row. Just a little leverage with the fork does it without damaging the carrots in the process. 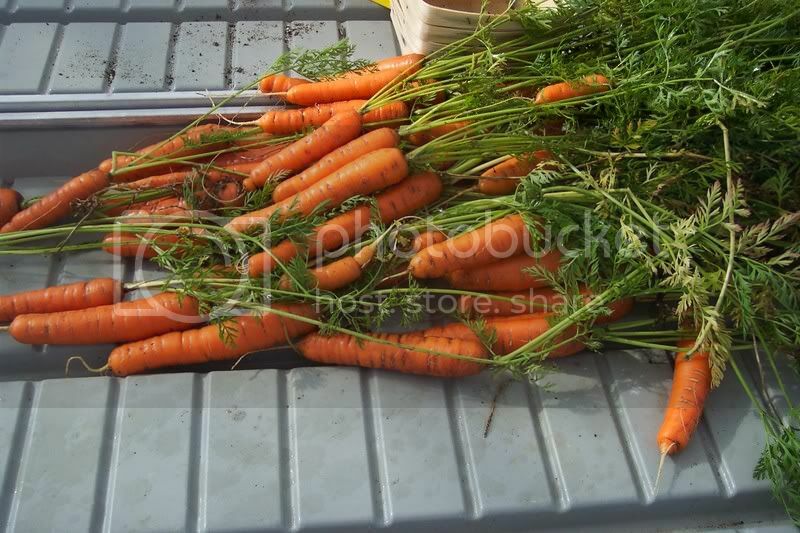 You don’t have to lift the carrots out with the fork, just ease their grip on the soil and they will pull right out. A quick rinse with the garden hose and these carrots are ready for the ‘fridge. If you take the tops off, they seem to stay fresher longer in storage. Kids however, like to leave the tops on and eat them like Bugs Bunny! We also staggered our planting this spring so as to be able to dig carrots over a longer period of time. I always like to leave the last carrots in the ground without digging them. The cold soil seems to sweeten them up even more and they get so crunchy that they “snap” when you bite into them. Every day I dig a fresh carrot or two to eat for elevenses and lunch. You can’t get any fresher than that!